Hope Pettibon, the 2017 American Honey Princess, will visit Kentucky March 6-11. She will participate in the Capitol City Beekeepers Association’s Bee Friendly Frankfort event and will be a guest speaker at the Bluegrass Beekeepers Bee School on March 11. During her visit, she will speak about the importance of honey bees to Kentucky agriculture and how honey bee is key to our next meal. She will also share information about the many uses for honey in the home. Hope is the 20-year-old daughter of Patrick and Christie Pettibon of McKinney, TX. She is currently attending a bible college in south Texas and has future aspirations to be a wilderness emergency medical technician. Hope has been keeping bees with her family since 2004 and has earned awards for her honey. Prior to being selected as the American Honey Princess, Hope served as the 2016 Texas Honey Queen. In this role, she promoted the honey industry at fairs, festivals, and farmers’ markets, via media interviews, and in schools. 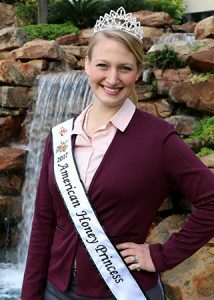 As the 2017 American Honey Princess, Hope serves as a national spokesperson on behalf of the American Beekeeping Federation, a trade organization representing beekeepers and honey producers throughout the United States. The beekeeping industry touches the lives of every individual in our country. In fact, honeybees are responsible for nearly one-third of our entire diet, in regards to the pollination services that they provide for a large majority of fruits, vegetables, nuts and legumes. This amounts to nearly $19 billion per year of direct value from honeybee pollination to United States agriculture. For more information on Princess Hope’s visit and to schedule an interview, contact Capitol City Beekeeper Association Marsha Bezold at the following number: 859.753.4450 and email at dlozeb@bellsouth.net.